Snippets of Jack: "Jack Sparrow Sent Me"
Will, determined to ensure Elizabeth's safety, agrees to find Jack the key to the heart of Davy Jones as a trade for Jack's compass. The crew sets out to find the Dutchman. Intead, they find a shipwrecked boat in the middle of the sea. Will: "That's the Flying Dutchman? She doesn't look like much." Jack: "Neither do you. Do NOT underestimate her." Of course, Jack knows its not really the Flying Dutcman but what Will doesn't know, won't hurt him. Well, sorta. Gibbs: "Must of run a fowl of the reef." Jack: "So what's your plan then?" Will: "I row over, search the ship until I find your bloody key." Jack: "And if there are crew men?" Will: "I cut down anyone in my path." Jack: "I like it. Simple. Easy to remember." Yes, Will is quite the genius. Will hops onto the little ship and finds all these terrible looking people who are at the verge of death. Confused, he tries to look around for the key. Then, the real Flying Dutchman appears captained by none other than Davy Jones himself. Jones recruits some of the others on the ship, and then kills the others. Jones: "Life is cruel. Why should the afterlife be any different." He reaches Will and is somewhat confused. Jones: "You are neither dead nor dying. What is your purpose here?" Will, remembering what Jack told him to say if he ran into any trouble, weakly says, "Jack Sparrow sent me to settle his debt." Jones: "What is your purpose here?" 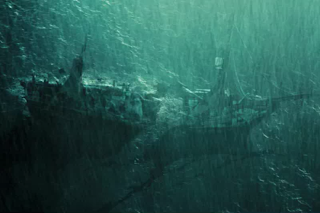 Will: "Jack Sparrow... sent me to settle his debt." Jones:"Did he now? I'm sorely tempted to accept that offer." Captain Davy Jones and his crew use their creepy teleportation powers to hop on board the Black Pearl. Jones reminds Jack of their agreement: that Jack would captain the Pearl for thirteen years and then spend the rest of his life on board the Flying Dutchman. As tempting as that sounds, Jack tries to decline this, claiming he was only captain for two years before the was stranded on the island. Jones: "Then you were a poor captain but a captain nonetheless." Ouch. Jack: "You have my payment. One soul to serve on your ship is already over there." Jones: "One soul is not equal to another." Jack: "Aha! So we've established my proposal in sound principle. Now we're just haggling over a price." Actually, I think Will is pretty cool. Jones: "Price?" Jack: "Just how many souls do you think my soul is worth?" Jones: "One hundred souls." Wow. Jack must have quite a divine soul. Jack, however, wants to keep Will with him on the quest for souls. Jack: "Have you not met Will Turner? He's noble, heroic, and a terrific soprano. Worth at least four, maybe three and a half. And did I happen to mention... he's in love? With a girl. Due to be married. Betrothed. Dividing him from her and her from him would only be half as cruel as acutally allowing him to be joined in holy matrimony. Eh?" Jones: "I keep the boy! Ninety-nine souls." Oh, nice try Jack.